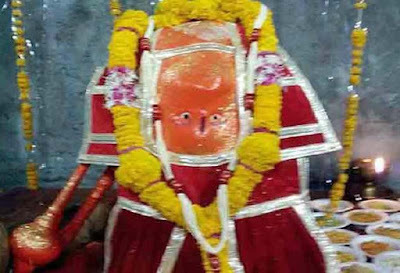 Ulta Hanuman Mandir located at Sanwer, around 30 km south of Ujjain, is famous for a Hanuman murti (idol) which is upside down. The devotees who visit the temple are full of stories of desire fulfillment, relief to health issues and family problems. It is a swamyambhu murti - that which appeared due to divine providence. The story of Ulta Hanuman Mandir is associated with Ahiravana. The popular belief is that Hanuman went to the netherworld ( Patal loka) from the spot where the Ulta Hanuman murti is located. Ahiravana had kidnapped Bhagvan Sri Ram and Lakshman and taken them to the Patal Lok. Hanuman went to the underworld and rescued the brothers by annihilating the demon. People visit the temple for three or five Tuesdays continuously for peace and prosperity in life. The belief is that even the most difficult problems in life will be solved after having darshan of Hanuman here for five Tuesdays. The main offering to Hanuman here is Chola – chickpeas. The temple courtyard has numerous trees associated with Hindu religion among them are two ancient Parijata tree. There is a belief that Hanuman resides in the tree.